On a daily basis people face some weird extra tissues that don’t look like they want them be part of their face. 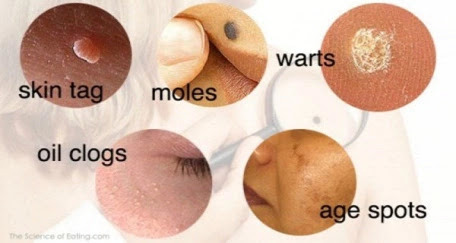 Skin tags, moles, warts, blackheads, age spots… All of them represent an unpleasant guest people want to get rid of as soon as possible. In order to eliminate them and get back the natural look of the skin, people tend to buy any cream or mask they read about. After using everything available without consulting an expert, instead of treating them, they just make them more and more irritable, dry the skin and make a perfect surface for them to grow. You notice inflammation and redness of the skin as a result of the inconvenient treatment. Instead of using chemicals in treatment, here are some advices which may help your skin recover from unwanted guests. Since the ethology of warts is well-known to be cause by virus, HPV or Human Papiloma Virus. HPV can be transmitted to other people in your surrounding by sexual contact, therefore warts can disperse to the people you transmitted the virus. The natural cures have shown positive results in curing these unpleasant warts which can be dangerous and painful. All you need are the following products and patient. Every natural cure helps you in a prolonged period. You will need to give time enough for them to help you. The mechanism apple cider vinegar works on, is based on its anti-inflammatory properties. Its properties are a good immune response on viruses and bacteria. The area where you apply vinegar should be washed, and then you soak a cotton ball in the apple cider vinegar and gently apply it on the warts. Then, you cover it with a bandage or duct tape and leave it for a period of one day. Do this before going to bed and remove the bandage in the morning. With this treatment, wards will disappear in a matter of several weeks. Despite being a natural miracle for many diseases and unpleasant conditions, it is a great herb for warts removal. Mash some garlic and apply on the wart and cover the area with a bandage. Repeat this process twice a day, until the warts are gone. Many people rub the inner surface of the banana peel over the warts, several times per day and got rid of warts. You can also press the inside of the peel over the wart and tape it before going to bed. You remove the bandage in the morning and wash off the area. This procedure should be repeated until the wart starts to soften, about a week or maybe more, depending on some other factors too, like your immune system. This is a scientifically proven method of warts removal. In one study, 61 patients with warts received either duct tape treatment or cryotherapy. After a period of two months, 85 percent of those people treated with duct tape had no warts at all, whereas only 60 percent of those with cryotherapy. You apply a small piece of duct tape over the entire wart for 6 days, by replacing the tape as needed. After 6 days, the wart should be washed with water and then rubbed off with a pumice stone or an emery board. In the morning, you apply a new duct tape for another 6 days, and continue to do so as long as the wart does not go away. The very important thing you all need to know before trying to import these methods in curing warts is the fact that in the same time you have to improve your immune system. Warts become visible when your immune system is not able to keep the virus inactive. So you have to consume the very best food our other articles recommend you to. Organic Manuka honey, from New Zealand, is the best honey to use for warts removal, but another homemade raw honey should be helpful as well.Manuka Honey is powerful type of honey when it comes to the concentration of its antibacterial properties. This is a very stable honey, unlike other types and it will not lose its benefits due to temperature changes. Here is some recipe of how to use it in curing warts. All you need is a teaspoon of raw honey and a bandage. Cover the area of warts with the dose of honey and wrap it with a cloth. Leave it like that in the next 24 hours. Apply this procedure every day.